The European vision industry is expected to grow eight per cent in 2016, according to the latest figures from VDMA Machine Vision. ‘In Germany alone, the turnover has more than doubled within ten years and an end to the boom is not in sight,’ commented Dr Olaf Munkelt, chairman of the board of VDMA Machine Vision at a press conference at the Vision trade fair in Stuttgart. The sector in Germany will have a turnover of €2.2 billion. According to current surveys, VDMA predicts a further growth in the European machine vision industry in 2017. The North American market, by contrast, is expected to contract by one per cent in 2016, with projected sales of $2.3 billion. Alex Shikany, the AIA’s director of market analysis, presented the AIA’s latest market statistics at Vision 2016. The third quarter of 2016 has seen a resurgence in sales in North America from earlier in the year – Q3 was up seven per cent on the same quarter last year; Q1 2016 fell by 11 per cent. 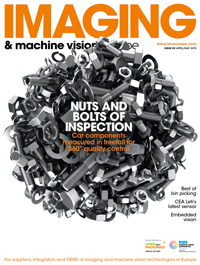 According to the VDMA, the automotive industry is still the world’s largest customer of the European machine vision industry, with a share of 20 per cent of the overall turnover. The electronics industry – including semiconductors – was the second largest customer with a share of 12 per cent, followed by the metal industry as well as the food and beverage sector with a share of 7 per cent each. For the European machine vision industry, Germany was the major sales market: 33 per cent of the turnover was generated in Germany, 12 per cent more than in the previous year. North America generated 14 per cent and was the second most important export market (11 per cent increase), followed by China with an 8 per cent share of the turnover (16 per cent increase in comparison with 2014). Shikany commented during the Vision trade fair that ‘manufacturing is, to some degree, coming back to North America’. He said that China labour costs are only four per cent lower than in the US. Shikany pointed to greater automation in Mexico and Canada as potential growth areas for machine vision – Ford has recently taken some of its operations to Mexico, for instance. The AIA forecasts three per cent growth in the North American vision market in 2017, and further growth of five per cent in 2018.